The Toronto Dingos continued their winning ways this past weekend, squaring off against the 2010 Grand Finals opponents, the Central Blues, and pulling away with a solid 7-goal win after four quarters. 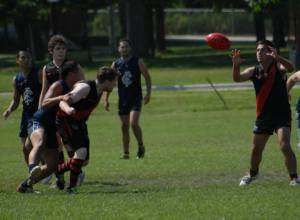 The win puts the Dingos solidly in Finals contention, 14 points up on the 7th place High Park Demons and good enough for 4th seed (at the moment). Throughout the week, the coaches had been hammering home that the Blues' win-loss record was an illusion, with many of their losses coming in tightly-contested matches and the Blues having recently upgraded their roster in key spots. Needless to say, the emphasis was to take nothing for granted heading into the match, and to bust out of the gate in the first quarter. Unfortunately, the latter part of that message was somewhat lost on the Red and Black, as the team once more came out flat against a very quick Blues squad, allowing the Centralites to dictate much of the play throughout the first half. Thankfully, the Dingo backline continued to play shutdown footy, led by all-star fullback Dave Wells and supported by sophmore Pat Bossey and rookie Kristian Frantzen, who time again would but their bodies on the line for a punch or a tackle. With the backline fighting off a hectic Blues attack, much of the play spilled out to the wings where the Blues speed was met by the veteran savvy of the Dingo mid-fielders, with the likes of Justin Robertson, Shaun McKay and Anthony O'Brien fighting for clearances and pumping it into the forward line. Unfortunately, that was were the link broke down, and the disconnect between the mid-fielders and foward lines led to a few too many turnovers for the coaches liking. The Dingos managed to escape the first quarter with a slim 3-point lead, but were facing some major adjustments for the second quarter. Much of the Blues' attack was being channeled through Kyle Docherty, an old rival from 2010, and the coaches gave Max Parish the task of shutting him down for the rest of the game. While Doch's posessions did decline with Maxy tagging, the Dingos still couldn't quite find their legs, flagging behind on rebounds from the Blues backlines and forcing the backline to again step up and play desperation defense. Thankfully, execution in the Dingo forward lines (when it stayed in there for more than 30 seconds) was fairly good, with Wade Edwards and Craig Stewart making good on their set shots and keeping the Dingos slightly in front on the scoreboard. Once again, the Red and Black escaped the quarter with a slim lead (4.1-25 to 2.8-20), but had been wildly out-played as the scoring chances (5 to 10) suggest. Much like the match before against the Demons, there were more than a few strong words from the coaches during halftime, and the Dingos came out for the 3rd knowing they had to take control of the game. Playing against the wind, the coaches sided to drop alternating ruckman Tom Bell to the half-back line as a floating defender, opening up the forward lines for the speed of Wade and newcomer Rainer Haycraft, who was playing in his first game as a Dingo. The effect was immediate, as the backline was more than able to hold off any Blues push with the extra man, and the counter-attack by the Dingos was quick and lethal. The open forward lines gave the Dingos more space to make plays, such as rookie Camilo Serpa, whose speed out in the open and big kick drove the footy deep into the Blues backline. The Dingos also came alive through the middle, as the rotating ruckmen of T Bell and D'Arcy Hill synced with their rovers and began to win centre-bounce after centre-bounce, along with the help wingman Denis Cormier who was cutting right though packs and pumping the footy forward. Everything seemed to suddenly click for the Dingos - as the legs began to fail on the Blues, the Red and Black poured it on in the fourth quarter, tallying up 8 goals in the second half while holding the Blues to just 3. The game was capped by a fantastic goal by longtime veteran Stewy - his 351st for the squad - as he busted through two Blues and snap in a spinning goal on an angle. Detailed results can be found here. Photos for this match are up now on our Facebook page. Next up the Dingos travel to steeltown to face the struggling Hamilton Wildcats, before taking a much-needed long-weekend break.